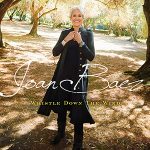 Legendary singer, songwriter, activist and Rock & Roll Hall of Fame inductee Joan Baez, has announced the UK dates for her extensive 2018 world tour. In conjunction with the tour, Baez will release a new studio album ‘Whistle Down The Wind’ (more details coming soon), produced by Joe Henry, in early March 2018. This will be her first new record since 2008’s acclaimed ‘Day After Tomorrow’.